So it has been several years since I abandoned this blog. Today is a major day in the history of space exploration, the twentieth anniversary of the Voyager Neptune flyby. While the planet itself was fascination, perhaps the most fascinating part of the flyby was Voyager's visit to Neptune's largest moon, Triton. It was an exhilarating feeling seeing the Neptunian system come to life, a feeling that will perhaps be replicated when New Horizons completes the initial reconnaissance of the solar system at Pluto (regardless of what you think of Pluto's status, when we set out to explore the solar system it was considered a planet, so to claim that our initial reconnaissance is complete because of its demotion feels hollow). 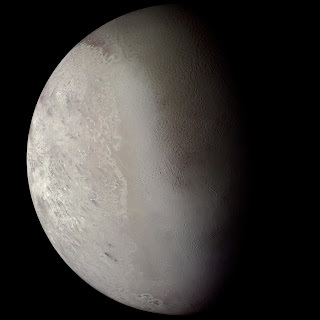 I will post some views of Triton today, and will be posting more material today and in the coming days. This is a sequence showing the changing view as Voyager flew by Triton. The upper tip of the last view is reconstructed from other images because all the images were cut off. This is a mosaic using some of the imagery obtained during the closest portion of the encounter. A wide angle shot showing one of Triton's geysers in the upper left.